One of the big questions in prostate cancer research is how can we diagnose prostate cancer better? We've awarded grants to two new clinical trials working to improve diagnosis by refining imaging technology. Sound familiar? That's because these trials are part of a growing wave of research in this area and things are moving fast. We’ve recently talked about the possibilities of using a new type of imaging called multiparametric (mp)MRI to improve diagnosis, and why a breakthrough like this could be such a big deal. Initial results in specialist centres look extremely promising, however mpMRI is expensive. It requires specialist equipment and training and is still in the middle of a large-scale clinical trial, the PROMIS trial, which we hope will help us decide whether mpMRI really is the future of prostate cancer diagnosis. But science stops for no man and other trials are also going on. Researchers are working to refine this technology and to compare it to, or combine it with, other imaging techniques to see if it can be improved. They are also looking at whether the same results can be achieved for a lower cost. The grants we’ve recently awarded are funding two such trials. The first is a joint award from Prostate Cancer UK, The Movember Foundation and the Scottish Government, who have awarded £500,000 to scientists at Dundee University to fund an early stage clinical trial. In this trial the researchers, led by Mr Ghulam Nabi, will first use mpMRI to identify where in the prostate the cancer is likely to be, so they can see where to target a biopsy. Once the mpMRI has shown which bit of the prostate to biopsy the researchers will use another imaging technology, called ultrasound, to guide the biopsy needle to the right place. Mr Nabi believes that combining mpMRI with ultrasound will greatly improve how doctors target the biopsy to get a more accurate diagnosis. The next step of this trial will test how well mpMRI can tell the difference between aggressive and non-aggressive prostate cancer to make an accurate diagnosis. Around one third of the men on the trial are likely to go on to have their prostates surgically removed, so the researchers will be able to examine the whole prostate after surgery and compare it to the mpMRI image. Was all the aggressive cancer in the prostate picked up by the mpMRI, or did it miss anything? How well did mpMRI and ultrasound together identify the right part of the prostate to biopsy and then target that area with the needle? How successfully did mpMRI identify aggressive prostate cancer and rule out non-aggressive prostate cancer? 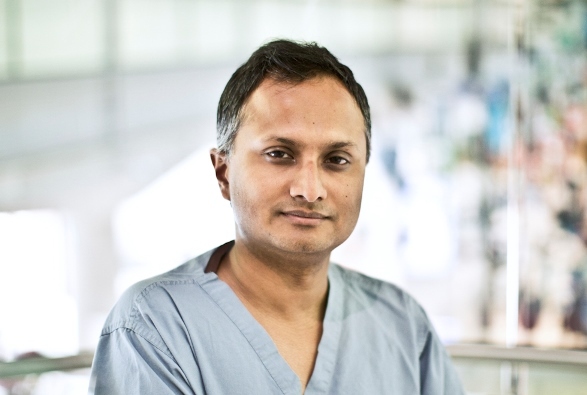 Prostate Cancer UK awarded a second grant, funded by the J P Moulton Charitable Foundation, to Mr Hashim Ahmed at UCLH. Mr Ahmed is investigating whether combining different types of ultrasound images, in a technique called multiparametric (mp) ultrasound could be a less expensive alternative to mpMRI for diagnosing prostate cancer. At the moment, doctors can get an image of the prostate using mp ultrasound in about 10 minutes (mpMRI imaging takes 40-50 minutes) and hospitals already have the right equipment for this, so if it works, mp ultrasound may well be a cost-effective alternative to mpMRI. This will be the first time this technique has been tested for prostate cancer diagnosis. It involves combining information from three different types of ultrasound scan. The researchers hope this will show up enough differences in tissue stiffness, the number of blood vessels and how well the tissue is organized between normal and cancerous prostate tissue to accurately pinpoint cancerous areas in the prostate. Men who’ve already had one standard biopsy that showed either negative or low-risk disease, and who would usually be asked to return for a second biopsy anyway to confirm the results, will be invited to take part in this trial. They will have both mp ultrasound and mpMRI scans, as well as a template mapping biopsy. By comparing the results of the scans to the template biopsy, the researchers will see how accurately mp ultrasound and mpMRI can each detect aggressive and non-aggressive prostate cancers. And by comparing the results of the mp ultrasound and mp MRI scans, the researchers can work out whether mp ultrasound could be a realistic, cost effective alternative to mpMRI for prostate cancer diagnosis. We don’t know whether these trials will give us all the answers we need to take away some of the uncertainty surrounding a prostate cancer diagnosis. But the speed with which research is moving – taking new ideas, refining, adapting, combining them, then testing them further – means that we can have real hope that one day soon, a man with a raised PSA might be able avoid a painful biopsy if his scans make it look unnecessary. And a man diagnosed with prostate cancer can feel secure in his decision to treat or not to treat, based on reliable information about how aggressive or not the cancer is likely to be.